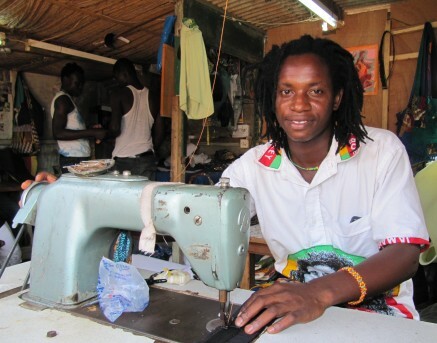 Ras is part of a team of young tailors in Ghana, West Africa, that specializes on all sorts of cool African bags. Together, they sew themselves out of poverty. These guys are a wonderful example of a typical African micro business: They want no foreign aid nor charity to feed their families and send their kids to school. All they need is happy customers! Every young African drummer I know owns at least one piece of clothing or bag with this look. made of quality African fabrics. For standard size 13"-face djembes. A must-have for any djembe player! Of course, your bag will look slightly different from the one in the picture: Each case is hand-made and unique. Nobody else will have the exact same bag! The handy tightening system makes packing and unpacking a snap. Most importantly, it ensures that your drum is tightly and securely wrapped. 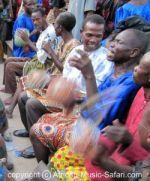 Drumming events are there to enjoy, not to make you worry about your djembe getting damaged. A thick pad protects the hide effectively. In fact, the whole bag is padded and very sturdy to avoid scratches and holes. Easily adjust the padded shoulder straps to carry your drum more comfortably. 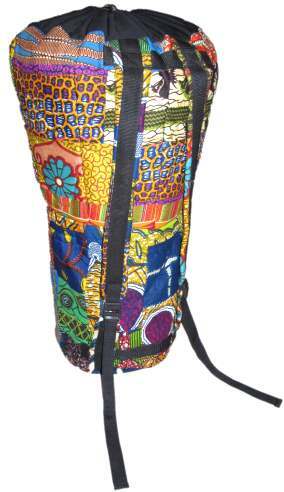 The bag is designed to fit standard size djembes with a 13"-diameter head and 25" hight. I wanted to let you know that my djembe bag arrived yesterday and it is great! It fits my drum perfectly and I love the patchwork colour scheme. Thanks again. I'm so sorry, Ras' djembe cases are currently out of Stock. Please check again later.